How does travel pricing really work? 22 Jun How does travel pricing really work? If you’ve spent any time at all trying to plan a trip online, you probably know how confusing travel pricing can be. There are hundreds of websites all claiming to have some special offer or lower price than you can get anywhere else. And there are literally as many myths about travel pricing as there are people selling travel. 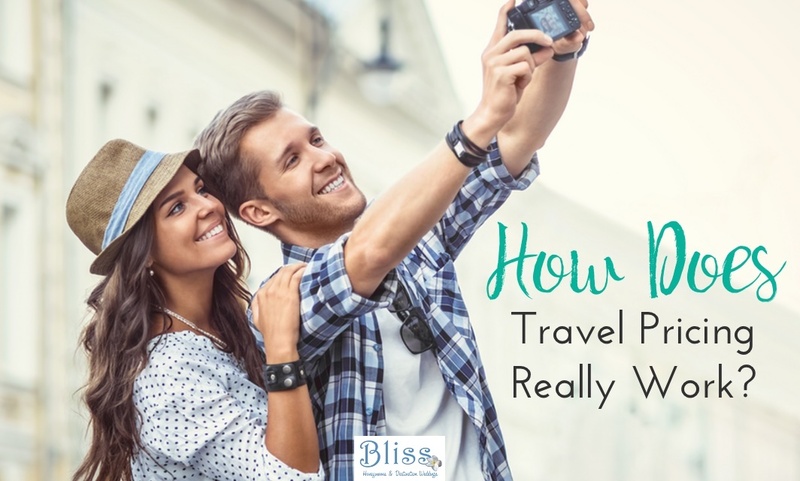 So today what I would like to do is dispel some of the myths, and give you the scoop on how travel pricing really works. Fact- While it may be true that some travel agents do charge fees and mark up the prices; for the most part the price you get from your honeymoon planner should be the same as the pricing that you find online. Agencies also have relationships with preferred suppliers which may give them access to specials and promotions that you may not be able to find on online sites. Fact: Many hotels and cruise lines have a very strict no discounting policy because they want all agencies, both online and offline, to compete on service rather than price. One big online giant was recently issued a stop sell by Sandals because they were illegally discounting Sandals’ pricing. So if a web site offers you a price that sounds too good to be true, it may very well be. And the hotel may not honor that deeply discounted price upon arrival, as one couple learned upon check-in for their wedding in St Thomas. They had to cough up over $1000 to cover what they thought was a travel deal they had purchased online. Again special pricing is offered to agencies and suppliers based on relationships. Myth #3-If I shop around, I can get a bunch of agents to compete for my business. Fact: Your trip has four parts to it-airfare, hotel, transfers and insurance. Your travel agent doesn’t own any of those four companies, or set their pricing. However, your honeymoon planner should know how to put your package together in a way that offers the most value and gives you the best price. I actually had a guy yell at me once because he called the hotel and got the same price I had given him. The hotel shouldn’t cost more from a travel agent that it does from the hotel. But again, be concerned if it’s significantly less. Myth: If I wait till the last minute, the price will go down. This can work with cruises, as the cruise lines would rather sail with full ships. But this rarely works for airfare. If you’re booking less than 21 days before departure, you can expect to pay a premium. All travel agencies, both online and offline, get paid by the hotels after you have checked out. When hotels calculate pricing, they know that they will be paying someone, whether it’s an agency like us, or an online agency. So when you do all the research and book online, you’re essentially paying for a service that you’re not getting. Any agency, whether it’s an online giant or the agent around the corner from you, can offer great pricing. But it’s important to remember that value and price are NOT the same thing.